Thank you for participating in the Swiftsure International Yacht Race, among the most challenging and prestigious international long-distance yacht races in our corner of the Pacific Ocean and we’re grateful you have joined us for it. The Swiftsure Race Committee has written this to make one part of your Swiftsure experience – entering and berthing in Victoria harbour – as painless and pleasant as possible. Victoria Harbour is busy! Over 150,000 vessel and aircraft movements take place in the harbour every year: over 400 movements per day. Many of these are seaplanes that taxi, take off, and land in two runway areas inside the harbour. Seaplanes land quickly and are not agile on the water. When you pass into or out of the outer harbour, north of the breakwater and south of Shoal Point, stay close to the eastern side. If you must cross to the western side of the outer harbour – and you don’t have to as part of Swiftsure – cross only between Shoal Point and Berens Island, along the dotted blue line in the harbour plan, and cross only when the white strobe lights located on Berens Island and the Shoal Point dolphin are not flashing. When flashing, these lights indicate a seaplane is about to land or take off. Once you pass Shoal Point, you’ll turn east into the middle harbour area between Shoal Point and Laurel Point. A line of yellow buoys marks the small craft channel, which lies to the south of the east-west seaplane runway. Please stay close to and to the right of these yellow buoys as you transit the middle harbour area. The narrows at Laurel Point are the passage from the middle harbour to the inner harbour and all types of traffic must mix together in these narrows. Give large commercial vessels and seaplanes in these narrows a wide berth, waiting until they have passed through if necessary. As you enter Victoria’s Inner Harbour, turn toward the Causeway docks, about 30 degrees off your starboard bow. The floating dock in front of the hotel is where the Swiftsure fleet rafts up before and after the race. Race yachts don’t have to raft here, although moorage on the Inner Harbour Causeway docks is a prepaid part of your entrance fee. You are welcome to pay for a berth at one of the other berths operated by the Greater Victoria Harbour Authority and several hotels, but we hope you won’t because having all the race yachts together creates a “happening” and a great sight for visitors. If you choose to not moor in the Swiftsure-provided docks, we recommend an advance reservation through GVHA. As you pass through the narrows into Victoria’s Inner Harbour, you’ll be met by our welcoming vessel, usually a RHIB, crewed by Royal Victoria Yacht Club members and other volunteers who will help you navigate toward your check-in with Canada Customs or toward your berth at the Greater Victoria Inner Harbour Causeway docks. If you are entering Canada from the United States (or any other country), you must clear your boat and everyone aboard with the Canada Border Services Agency. Go directly to the Canada Customs dock located to starboard in the middle harbour area east of Fisherman’s Wharf, and north of the Coast Victoria Harbourside Hotel which you can see from the water. Note that the Customs dock has been moved here from its previous location. To arrange Customs clearance, please contact Canada Border Services Agency at 1-888-226-7277. There is a phone located on the Customs dock that will connect you with CBSA. You must clear Customs PRIOR to berthing in the Inner Harbour. The Customs dock can accommodate vessels up to 160′ or 49m in length. If your vessel is over 160′ or 49m, contact Customs to make alternate arrangements. If you have any questions about clearing Customs, please call Canada Border Services Agency at 1-888-226-7277. We’re unable to officially give advice as to what’s required to clear customs – although we know that vessel registration and proof of citizenship for all aboard is a good start. Please check with the Canada Border Services Agency. As you transit the inner harbour toward the Inner Harbour Causeway docks, please keep an eye out for large commercial vessels, particularly the MV Coho that operates from the wharves on the south side of the inner harbour, i.e. off your starboard side when entering the harbour. When large commercial vessels enter or leave the inner harbour, our welcoming boat will ensure you move as quickly as possible to a position north and east of the Steamship Terminal Building and hold there until the commercial vessel is clear of the area. Once you arrive at the Inner Harbour Causeway docks, our volunteers aboard RHIB ‘Beaker’ and on the docks will direct you to your berth. We’ll ask you to back into the docks, with your bow toward Laurel Point and your stern toward the GVHA Inner Harbour Causeway, and to have an anchor ready at your bow if we need to secure you with a hook (if you are on the outer end of the docks). We have more boats than we can put directly alongside the docks, so you may need to raft or be rafted upon. That’s part of the fun, but we know that some boats have special requirements to be directly alongside a dock. If you have a special need please contact us IN ADVANCE: Swiftsure Administrator at the Royal Victoria Yacht Club: (250) 592-2441, info@swiftsure.org. Unfortunately, we can’t accommodate “mother ships” or other support vessels on the GVHA Inner Harbour Causeway docks or Ship Point. The fleet needs to be able to break up the rafts quickly and make a clean getaway on Saturday morning and shifting support boats around makes this difficult. If you want your support vessel nearby, we suggest you contact the Greater Victoria Harbour Authority to reserve a slip on the Wharf Street docks. While you’ll have to pay, the rates are reasonable and your support boat will be a short walk away from your racing boat. If you need assistance or advice once you are berthed, please seek out our duty dockmasters. As well, yacht hosts will be at the dock to answer any questions you may have and to welcome you to Swiftsure and to Victoria. They’ll direct you to the Swiftsure Centre. Don’t hesitate to ask any of our volunteers who will be wearing blue T shirts. If you need services, such as sail repairs, marine equipment, food, liquor, or have any other needs, ask us. We want to make your Swiftsure International Yacht Race enjoyable and memorable. After you cross the finish line, you should quickly douse your sails as you are not permitted to sail past Shoal Point and there may be a lot of vessel traffic in the harbour north of the Ogden Point Breakwater, including cruise ships on the east side just to the north of Odgen Point Breakwater. You are advised to check the Victoria cruise ship schedule for arrivals and departures of the berths at Ogden Point. 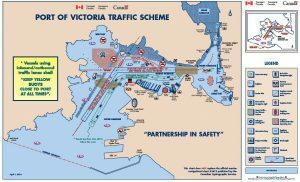 Avoid the floatplane runways and use the small craft channel as described above under ‘Entering Victoria Harbour’. If you have trouble starting your engine after the race, please call the Race Committee on marine VHF channel 26 and advise of your situation. If not an emergency the Race Committee will endeavour to dispatch a vessel to give you a hand. Of course, if a May Day, call the Joint Rescue Coordination Centre on marine VHF 16. Drifting into an active seaplane runway is a high risk so if you even suspect that you are drifting into one, contact the Victoria Harbourmaster on marine VHF channel 18A and advise them of your proximity to a runway. You will proceed to the Inspection Dock at Ship Point for a safety inspection as outlined in the Sailing Instructions. Once you complete this process, a Swiftsure dockmaster will advise you where to dock your boat if you are staying overnight or are tying alongside the docks for a shorter period of time.